Sharing the nio Platform with thousands of fellow IoT enthusiasts at IoT World 2018 was a thrill! Now, the niolabs team is looking forward to our next global event. Members of the niolabs team just got back from an action-packed three days at IoT World 2018 in Santa Clara. Alongside 12,000 attendees, 450 thought leaders, and 300 exhibitors, we were right in the middle of the IoT madness as a part of the Google Cloud Platform (GCP) booth. How can results be achieved with real-world IoT applications? How can these applications be built for scale? Over the course of our three days, we did our best to answer both questions, as we showcased the power of the nio Platform + GCP solutions in real production environments. In one example, we showed how nio and GCP are being used in conjunction to reduce natural resource waste while improving yield in agriculture applications. In another, we showed how a nio + GCP application has optimized business process and provided proactive security for employees in production factories. We even showed the beginning stages of how nio is being used to integrate Google speech, vision, and TensorFlow into fully immersive customer experiences in the retail space. Not only were these interactive demonstrations a ton of fun, but they left visitors impressed by the flexibility and power of nio at the edge alongside the scale of the Google Cloud Platform. 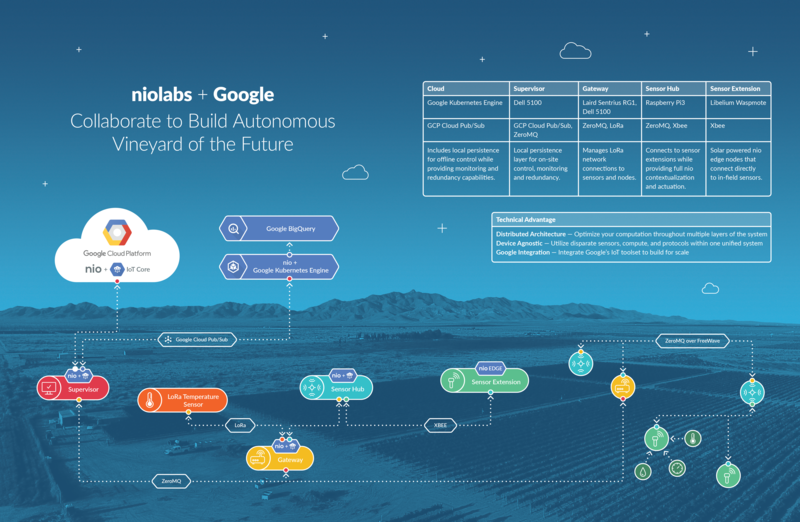 The nio platform easily integrates with Google’s suite of technology to create a fully autonomous vineyard. Although we’re still tying up loose ends from last week’s event, we are already looking forward to our next opportunity to showcase the nio Platform and our continued partnership with GCP. We are proud to officially announce that we will be joining Google on stage for Google Cloud Next 2018 in July at the Moscone Center in San Francisco. We have some special things planned, as this will be another step forward in continuing the nio + GCP partnership with some of the very best developers in the world, in the audience. We will be providing more details at niolabs.com and on all of our social media channels as the event gets closer, so stay tuned!